Mixcraft 5 ($75, 14-day free trial) is my second budget digital audio workstation (DAW) find in two months. Coming on the heels of my introduction to Magix Music Maker 16, M5 proved to be another worthy product working its way up the food chain from humble beginnings. The list of features introduced since version 4.5 should give you an idea of the designers' ambition: track level automation, a mixer with per track EQ, track notation, tube EQ and amp simulator FX, 5 new VSTi virtual instruments, and built-in noise reduction. That's a lot to work into an existing product, but Mixcraft 5 fits it in without unsightly seams. Though perhaps not quite as slick as some of the high-end DAWs, Mixcraft's interface is attractive, easy to get around and logically laid out. Mixcraft's interface is a colorful ode to the standard track-based metaphor. 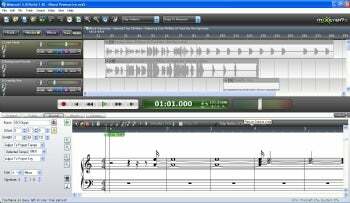 It has a pop-up pane located at the bottom of the main window which morphs between a project settings dialog, a mixer, a sound library, a midi editor, an audio editor, and sound information. I wish you could resize the pop-up, but I'm glad the company forsook the old-school pile of windows that was popular for far too long--and that probably wasted a million hours in searches over the decades. Just to be safe though, they let you undock the pane to a floating window if you wish. There are places where the GUI relies on standard Windows drop-down menus--which don't quite match the overall look-- but we're talking a solid B+ in the interface department. I don't love everything about Mixcraft 5. I like to tweak knobs on my FX and virtual instruments and with M5's and the graphical representations of such are always a step away by means of an "edit" button. Also, notation is on strictly a single track basis; there are no multi-track printouts or arranging that I could find. The bottom line is, don't sell Mixcraft 5 short just because it's inexpensive. There's absolutely no reason (except for a possible a lack of talent... kidding!) that you can't create professional-sounding recordings with it. I mean, come on now: $75 for a program that has a variety of pro-quality track and mastering FX, eight virtual instruments, rock-solid recording and editing (in my admittedly limited testing), a sound library and notation? Get outta town. Or at least get the trial download of Mixcraft and see if it fits your recording style.